In a celebration of the reinvention of a vintage retail format, Veronica Simpson examines the rise of the high-quality, low-cost street food market. Markets are having a revival. Once the preserve of hawkers selling dodgy designer T-shirts, mushy strawberries and bruised bananas, the market has become the go-to device for transforming down-at-heel neighbourhoods into destinations. A confluence of the ‘pop-up’ phenomenon of the early Millennium with the current interest in global street-food, the modern market has been rebranded as a place of quality, diversity and spontaneity: combining all the allure of a permanent destination with the pop-up’s constant refreshment of content and vitality. Borough Market established the template back in the late Nineties: a traditional early-morning wholesale market known for its quality, transforming two days a week into a retail experience, enhanced by its gritty but vintage London setting. Now, it’s an all-day, everyday food retail and street-food hub whose audience is 90 per cent tourist, and its original wholesalers have moved elsewhere. But the formula has been tried and tested – and been largely effective – all over the world. However, it’s not just shabby localities undergoing gentrification that the new market typology is being applied to. There are as many – if not more – stale or boring shopping destinations that have benefited from the injection of some market-style pizzazz. Anything from airports to major city shopping thoroughfares to department stores are now availing themselves of that curated, street-trader vibe. 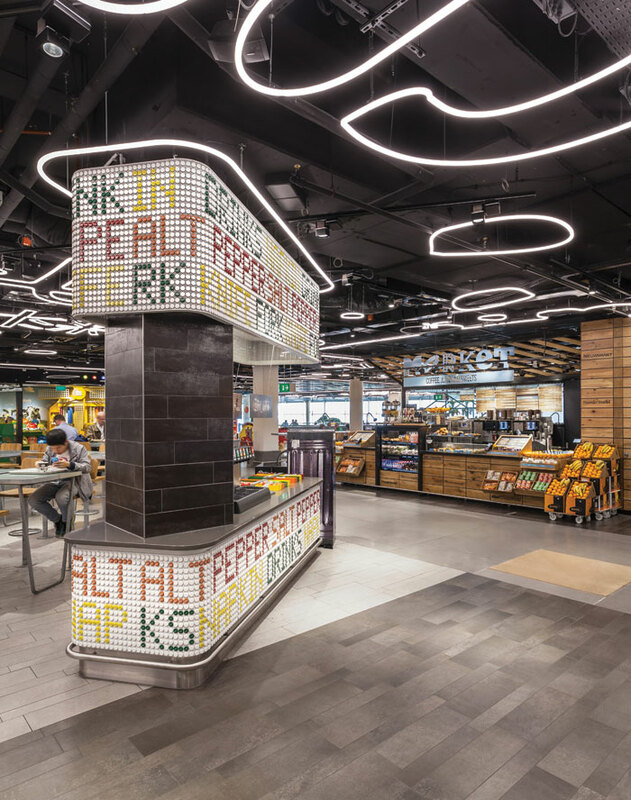 UXUS, a design agency based in Amsterdam and New York, has been working for American airport food and beverage company HMSHost for some six years. 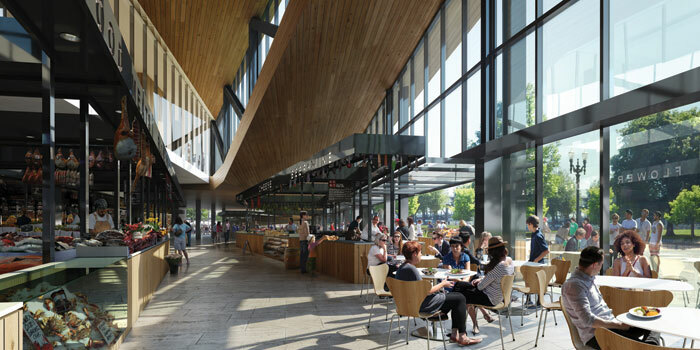 When it first approached UXUS, says UXUS principal Oliver Michell, ‘I had noticed that food markets were really upping their game, becoming one of the essential things to do when visiting a city or going on a day break. UXUS has now revived the food offer of not just several American airports but, more recently, Amsterdam Schipol (see case study). What it has done is make the offer ‘much more theatrical. You see food being produced in front of you. It’s very communal. People can share, you can eat in a group or on your own,’ he adds. Where did UXUS first see these trends manifesting? Spain, says Michell. ‘That’s where we noticed there was a lot happening, though I don’t think it originated there. In cities like Barcelona and Madrid they have taken traditional markets – like Santa Catarina, a traditional covered market [in Barcelona] that used to be fruit and veg – and turned them into these almost controlled environments where you have one operator that programmes the entire site and invite different providers to come in and ask them to do the best that they can do – whether it’s ice cream, sherry, ham or waffles. [Customers] can graze and try all sorts of different foods,’ he says. The next big thing, says Michell, is applying the dynamism of this new market typology to other kinds of retail. With beauty, for example, UXUS has created a more dynamic, marketstyle vibe for Selfridges, ‘breaking down the barriers between high and low’, as he puts it, and is about to launch something even more accessible for fashion retailer Forever 21. ‘It’s a new cosmetics brand called Riley Rose, launching on the USA’s west coast. It’s very much a market concept – beauty, food, gifting – and it’s really fun and colourful and young, very affordable but still very stylish. It’s very much a playground, playing to that millennial generation. There’s lots of stimulus. ‘Stimulus is something that the more traditional high streets lack – especially as the fascinating flotsam of independent retailers get swept away by the tsunami of global retail and coffee-shop brands, and as the big brands themselves become increasingly dependent on online sales. Architect and urbanist Harry Dobbs, of Harry Dobbs Design, has worked on a number of market concepts – in Oldham and Camden – as regeneration drivers, but wondered if the same market magic could revive an area that is far from deprived: Oxford Street. Thanks to an opportunity created by the New West End Company, as part of a larger Oxford Street regeneration scheme, Dobbs was inspired to suggest breaking up the static model of the big, branded stores with a more dynamic layer of retail woven into the side streets that currently ‘have no recognised value’. Bird Street, beside Selfridges, is one of those invisible alleyways. Now, it has its own little street-market vibe, with a string of colourful, origami-inspired kiosks that sell everything from handbags to technology, with young and emerging retailers offered varying tenure of a month to six months on the site, in a rotating, curated programme, over the course of this pilot scheme’s two-year life. Retail is all about interface. This gives them a chance to interface with the public they wouldn’t normally get. Bird Street really does drive people to come to the location with a set of experiences that can’t be substituted by e-commerce.